Steven Spielberg is keen to make Indiana Jones 5 — even if it puts Tom Hanks and Harrison Ford in competition for “actor who’s made the most Spielberg movies.” In an exclusive conversation about their new film Bridge of Spies, director Spielberg and star Hanks shared stories about the movies they’ve made and speculated about their next collaboration. Plans for Indiana Jones 5 were confirmed by producer Kathleen Kennedy in May, though she specified there was no timeline and “we haven’t started working on a script yet.” Spielberg’s quote suggests that both he and Harrison Ford are on board for the sequel, though neither has officially said as much. 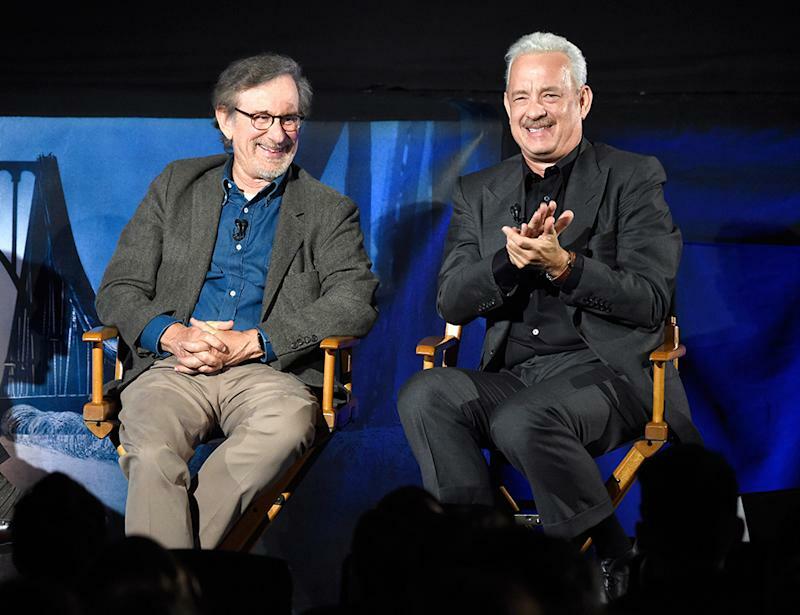 Here are some more highlights from Hanks and Spielberg’s conversation with Yahoo Movies. “The only movie of [mine] that I can watch over and over again is That Thing You Do, because I wrote it,” Hanks said of his 1996 comedy about a ‘60s pop band. For Hanks (who also directed), it was a positive working experience, with a great cast, “infectiously fabulous” music, and a final product that “came out the way I imagined.” His fourth child was also born during the making of the film, which adds to the happy memories. Spielberg concurred, with one exception. “I have trouble watching my movies, except I can watch them when I’m showing them to my kids for the first time,” he said. “Like, I won’t watch E.T. by myself, but I’ve shown E.T. to every one of my seven children at the appropriate age, and I’ve enjoyed watching a movie like that that I made through their eyes, because I see it in a different way every time.” That said, if he had to watch one of his movies alone, Spielberg would go with Raiders of the Lost Ark. Unlike certain other filmmakers, Spielberg doesn’t mind watching video on his phone. Tom Hanks’s hair is white because of his next role. Tom Hanks saved Forrest Gump by personally financing one famous scene.